It turned out that I did much better in the Run to the Roses fantasy leagues than I did in my real money Derby wagers. 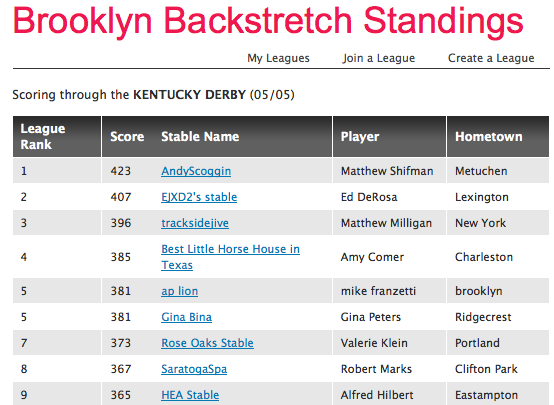 I won the Brooklyn Backstretch charity RttR league. All 66 participants make a pledge and the league winner gets to choose the horse related charity or charities that will receive the money. I am really proud to have won this league. The charity league is run by Teresa Genaro of BrooklynBackstretch.com. We all know Teresa from her writings for many different websites and publications and for her presence on Twitter @BklynBckstretch. At this point I am considering the Our Mims Retirement Haven in Kentucky, which is now the home of one of my favorite Breeders’ Cup champions, Elmhurst, who won the 1997 Sprint. Old Friends Cabin Creek – the Bobby Frankel division in Saratoga is another great retirement program. I feel it is also important to think about the people who do so much for racing. Thus, Belmont Child Care Association’s Anna House, for the children of the backstretch workers, is on my list. I also finished second in the horseracingnation RttR league, which had 47 entries. By my estimation there were over 15,000 total entries in all of the RttR leagues and my 423 points placed 222nd, not too bad. I had a very good Kentucky Derby Day on the last day of the leagues. I had a total of 11 of the Derby field in my RttR stable and chose Bodemeister, Union Rags, and Dullahan as my final three power horses. I’ll Have Another was in my stable and with Bode and Dullahan coming in second and third I scored 75 points. The RttR leagues were great fun and a terrific way to stay on top of the Derby trail. I just wish my Derby wagering could have been that good. This entry was posted in Breeders Cup, Churchill Downs, Horse Racing Nation, Kentucky Derby, Run to the Roses and tagged Bodemeister, Dullahan, I'll Have Another, Union Rags. Bookmark the permalink.